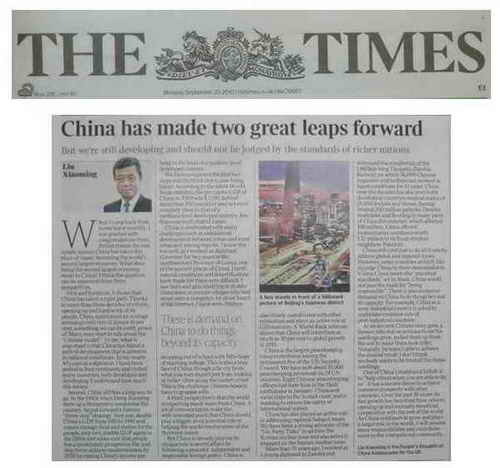 When I came back from home leave recently, I was greeted with congratulations from British friends for one simple reason: China has taken the place of Japan, becoming the world's second largest economy. What does being the second largest economy mean to China? I think the question can be answered from three perspectives. First and foremost, it shows that China has taken a right path. Thanks to more than three decades of reform, opening-up and hard work of its people, China maintained an average annual growth rate of almost 10 per cent, something we can be justly proud of. Many even start to talk about the "Chinese model". To me, what is important is that China has found a path of development that is suited to its national conditions. In my nearly 40 years as a diplomat, I have been posted to four continents and visited many countries, both developed and developing. I understand how much this means. Second, China still has a long way to go. In the 1980s when Deng Xiaoping drew up a blueprint to modernise the country, he put forward a famous "three-step" strategy. Step one, double China's GDP from 1981 to 1990 and ensure enough food and shelter for the people; step two, double GDP again in the 1990s and make sure that people live a moderately prosperous life; and step three, achieve modernisation by 2050 by raising China's income per head to the level of a medium-level developed country. We have completed the first two steps and the third step is now being taken. According to the latest World Bank statistics, the per capita GDP of China in 2009 was $3,700, behind more than 100 countries and not even remotely close to that of a medium-level developed country, less than one tenth that of Japan. China is confronted with many challenges like unbalanced development between urban and rural areas and among regions. I know this too well, as I worked as Assistant Governor for two years in the northwestern Province of Gansu, one of the poorest places of China. Harsh natural conditions and desertification have made life there very difficult. I saw boys and girls studying in shabby classrooms in remote villages who had never seen a computer, let alone knew what the internet is. I have seen children dropping out of school, with little hope of reaching college. This is also a true face of China, though a far cry from what you may expect just from looking at richer cities along the eastern coast. This is the challenge Chinese leaders have to grapple with. A third perspective is that the world is expecting much more from China. A lot of commentators make the well-intended point that China should play a bigger. even a central role in helping the world resolve some of the thorniest issues. But China is already playing its unique role in world affairs by following a peaceful, independent and responsible foreign policy. China is also closely coordinated with other economies and plays an active role at G20 summits. A World Bank estimate shows that China will contribute as much as 30 per cent to global growth in 2010. China is the largest peacekeeping troop contributor among the permanent five of the UN Security Council. We have sent about 10,000 peacekeeping personnel on 24 UN missions. Eight Chinese peacekeeping officers lost their lives in the Haiti earthquake in January. China sent naval ships to the Somali coast, and is working to ensure the safety of international waters. China has also played an active role in addressing regional hotspot issues. We have been a strong advocate of the "Six-Party Talks" to address the Korean nuclear issue and also actively engaged on the Iranian nuclear issue. offered humanitarian assistance worth 32 million pounds to its flood-stricken neighbour Pakistan. China will continue to do all it can to address global and regional issues. However, some countries unfairly like to judge China by their own standards. Unless China meets the "universal standards" set by them, China would not pass the mark for "being responsible". There is also excessive demand on China to do things beyond its capacity. For example, China as a semi-industrial country is asked to undertake emission cuts of post-industrial countries. As an ancient Chinese story goes, a farmer, who was so anxious to see his seedlings grow, pulled them up from the soil to make them look taller. Naturally he wasn't able to achieve the desired result. I don't think anybody wants to be treated like those seedlings. One of China's traditional beliefs is to "help others when you are able to do so". It has a sincere desire to achieve common prosperity with other countries. Over the past 30 years, its fast growth has benefited from reform, opening up and mutually beneficial cooperation with the rest of the world. As China continues to grow and plays a larger role in the world, it will assume more responsibilities and contribute more to the international community.